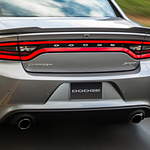 With a wide selection of powerhouse engines, its fantastic touchscreen interface, and a myriad of customization choices, the reliable Dodge Charger is unsurprisingly one of the most popular performance sedans on the market currently. Let's focus on one of their previously mentioned features: their engines. There are a total of four engines for the Dodge Charger that will give you all the power you need and then some. The Supercharged 6.2L HEMI SRT Hellcat V8 Engine is only available for the vehicle its named after (the SRT Hellcat). It can crank out a jaw-dropping 707 horsepower and 650 pound-feet of torque as well. Have any more questions about the Dodge Charger? Come to Leckner Chrysler Dodge Jeep Ram where any questions about the Charger can be answered, and you will have the opportunity to take a test drive.